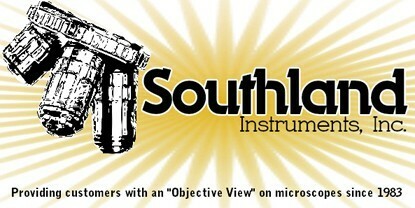 Southland Instruments, Inc. has in it's foundation been built around the service of microscopes and with that foundation can provide customers with the insight they need to solve most microscope related problems. Servicing Southern California and beyond - we handle educational, industrial, and medical industries as well as everything in between. 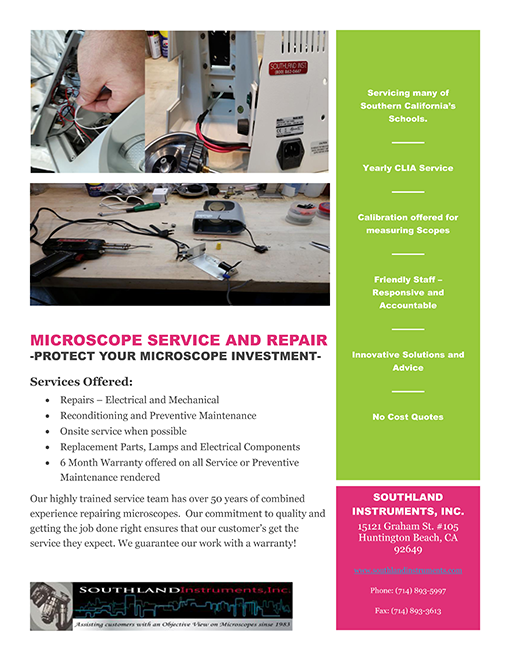 Microscope services include: "Preventive Maintenance, Scheduled Maintenance, Warranty work, Repair work, as well as providing repair and replacement parts where needed." Our microscope service technicians have worked on most brands and types of microscopes and with a combined 50 years of experience, no problem is too complicated. Whether you just have a question or need a microscope repaired we are happy to help! If we are not in your area - take a picture of your microscope and add a description of the problem - we will help you determine the root of the problem as well as the best coarse of action. Saving you time and money - allowing you to continue working is our goal!